PARIS — Rescue workers have found the bodies of three alpinists buried in an avalanche of ice and snow near a summit of Mont Blanc and dug them out with chain saws and a backhoe, a mountain rescue chief said Thursday. French Interior Minister Bernard Cazeneuve announced an investigation into the circumstances of the accident early Tuesday. Rescuers were only alerted to the missing climbers 36 hours after the accident. The bodies of two women, a 32-year-old Slovakian and a 33-year-old dual Polish-Briton, were discovered Wednesday night. The body of the 50-year-old German guide was recovered early Thursday, said Lieut. Col. Stephane Bozon, who heads the mountain rescue team in the French town of Chamonix. The three were climbing Mont Maudit, a summit of Mont Blanc, 4,100 meters (13,450 feet) high before dawn Tuesday when a tower of ice swept over them and they fell 150 meters (500 feet) to their deaths. Rescue workers had to use chain saws and a backhoe to free them from the ice, Bozon said by telephone. He said blocks of ice had fractured as the team climbed, creating an avalanche of ice and snow. A statement by the interior minister said 16 gendarmes, two dogs and a helicopter were mobilized to find the victims and recover their bodies. 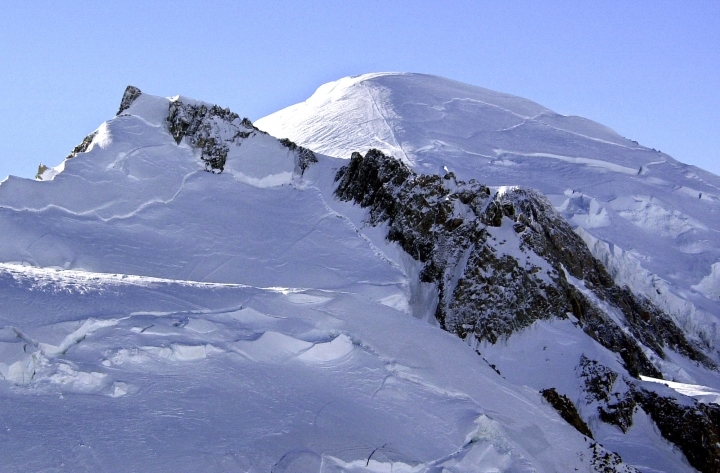 Bozon said his team was alerted only Wednesday evening to the missing climbers. Two other groups of climbers in the zone had said that no one was buried by the avalanche. A New Zealand guide was killed in the same sector by an avalanche of snow on June 20. Cazenueve said there have been eight fatal mountain accidents in France since last Saturday.